I’ve enjoyed blogging this month about poetry. It is a nice respite from my usual form, and I hope you have enjoyed our attempts at penning verses. To end this jaunt, you might browse your public library or a bookstore. Find the kind of poetry that speaks to you and add to your library. Buy a journal, something fun and inviting, and emulate the poems you enjoy, stretching your creative muscle and drafting a few poems. Read a poem or a Psalm from the Bible. Use them for meditation before the start of each day. Journal using words, phrases, verses that call to you. Introduce poetry to those around you. Besides those I referenced in my April 9, 2018 blog, try Shel Silverstein, Jack Prelutsky or Ogden Nash for the younger people in your life. To explore the male or female point of view, read Judith Viorst, Elizabeth Barrett Browning, or Emily Dickenson; or Pablo Neruda, Billy Collins, or Robert Frost. For the crafter in you, refer to George Ella Lyon, Susan Goldsmith Wooldridge, Georgia Heard, or Dunning and Stafford. Their suggestions are enlightening. There are so many books out there, waiting for you to discover them and add them to your library. Enjoy what is crouching inside your pencil, waiting to be spoken, and try your hand at poetry. Best of luck. Writing poetry does not come easy for me, but that does not mean I don’t occasionally try my hand at penning a few verses. My poetry collection numbers close to 100 books. It intrigues me so some of those books are on the craft of writing poetry. This week’s “how to write a better poem” suggestion comes from Georgia Heard’s Awakening the Heart. It is a technique she uses with students called the Six-Room-Poem that I found amazingly helpful. You take a sheet of paper and fold it into six boxes and position the paper landscape, three boxes on top and three boxes on the bottom. In box 1: describe thoroughly an image or a memory you want to use as the subject of your poem. You are not writing a poem yet, so just fill this box with description. If you are stuck, hold on, since you might get more ideas as you fill the other boxes. In box 2: describe the quality of light or shadow or colors about your topic. In box 3: describe your topic/image using the following senses: smell, taste, sound or lack of, and touch. In box 4: what questions does your image elicit, or what questions might it ask you? You could also use this square to note quotes or verses from other sources that fit your image/topic. In box 5: what feelings/imagery come from observing or describing your topic? In box 6: go over the five boxes and find an image, word, verse, sentence that stands out. Write it in this box three times. Go back over the six boxes and fill in more descriptions and images, build imagery using similes and metaphors or other figures of speech. If you have been successful, you now have enough material to write your poem. I have included a sample of what my six-room-poem looks like. she steps off the stage. cling to the end of her dance. 1. I copied words, phrases, or verses from the psalm that I really loved unto a sheet of paper, one example per line, then I cut them into movable pieces with a pair of scissors. 3. I took my bits of paper and moved them into different positions, paring phrases down to single words if necessary and creating line breaks where I wanted. It is always best to show an example so below is my version of Psalm 91. I hope it inspires you to try your hand at a found poem. Happy April is Poetry Month! 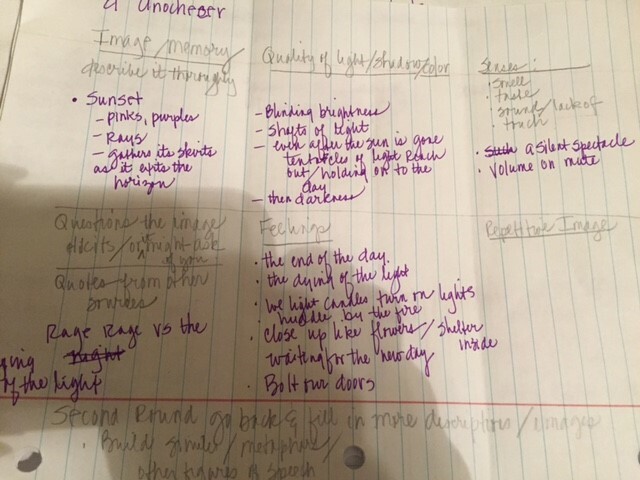 One of my favorite teaching units when teaching middle and high school students was The Poetry Unit. The kids would groan; the poet beaten out of them in elementary school, what with haikus, and tankas, and diamantes forced upon them by well-meaning teachers, year after year. I allayed their fears, promising them I would take their concerns to heart and maybe teach them something new, something innovative, something that would change their minds about April is Poetry Month that would not be too painful. I started off by brainstorming on the white board everything everyone knew already about poetry. And so it went until we had covered the white board with everything everyone offered. During lulls, I would ask questions to get more ideas. When the white board was covered with all of their ideas, I showed them a quick way to write Poem #1 (and copy notes off the board). Take a sheet of paper and number 1-20, skipping lines in between your numbers. Copy twenty ideas from the white board that stand out to you the most. Maybe they are new ideas or contradicting ideas or ideas that you feel a need to remember most. At this point just copy twenty ideas, one per line. Copy them exactly as written on the board. Do Not Change or Add Anything. When you are done, double check that you chose the twenty ideas you want to remember the most about today’s lesson. Scratch out one you do not want to keep and replace it with one you do want to keep. Read your list of twenty. Reorder them in any fashion you prefer; renumber the list out in the margin: most important to least, or least important to most, or mix one of each per line, or short line followed by a long one, or the reverse, clump together in stanzas, or clumped together in stanzas but the final line ending each stanza has the most importance. Remember a poem does NOT have to rhyme, so have fun with this. 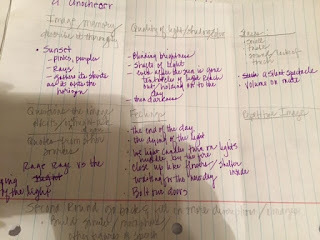 This is your rough draft, so when you are ready, rewrite (or if working on a laptop, move) your lines into their new positions, adding spaces between lines or stanzas. Some follow up lessons to this were lessons on enjambment, refrain, and punctuation, but one look at their finished products always lend themselves to other ideas. HAPPY APRIL IS POETRY MONTH.